she's decided to teach one more bonus class: It is a limited edition holiday class and it is first come first serve. This class has limited numbers. So we will open registration up next Wednesday. So come back here to register. Do you love to create cards? Are you more a layout type of person? Well, it’s time to pull the two together into one fabulous class! Join Vicki in creating a number of fun cards with Daisy Buckets Card Elements, stamps and papers and then take those same card techniques and create a fabulous two page layout! Techniques being explored will include paper piecing, stamping and more! This will be a great opportunity to learn how to stretch your crafting talents! Prizes and good times await so sign up to join in on the fun! Well, now I am totally excited!!!! are you? And once again we will have fun fun fun prizes to purchase raffle tickets for. We've been gathering some fun amazing things. And the best suggestion I was given is instead of having the huge prizes as last year, have more prizes for more chances to win. So of course we aim to please. With having the subtle theme of mini albums, I gathered as many unique albums as I could find and made awesome kits with the latest greatest releases. Can't wait to see your thoughts. And we have amazing sponsors as well this year. super cool! There is more to come, sponsors to talk about,and a major fun thing. I will update when life here resumes to normal. But I just wanted to keep you guys in touch. From now on, I will have a link to this post so that I will just keep adding new stuff to this one. Then it makes it easy to find. sounds good? WE HAD FUN MAKING THIS CAKE. and it is interactive, the little canons fire. yep I'd like to say I was cool, but I didn't even know this until one of the boys showed us. did I mention we wear costumes...like all the time? and Jager scored a brand new Ninja turtle one too. He is in love with that. wearing it and driving his new spiderman bike around the whole house. he is a happy happy boy! Jody's pumpkin was sure looking wicked! of course is any party complete without face painting? I hope you enjoyed our little party. I will show finished pumpkins one day, right now they are drying and still need a few more cosmetic touches. well today at My Stamp Box it was my turn to post, of course I am totally obsessed with the "Boo" stamps so I decided to create tags for my Halloween goodie bags. Tattered Angels Glimmer Mist- haunted Shadows,Raven,Marshmallow, Pumpkin Pie ,Caramel Apple. Superstock cardstock (from Canadianscrapbooker.ca website) -this is a super thick cardstock that doesn't warp. So take your cardstock and spray it all over with glimmer mist, use the fun stencils if you like. Then cut the paper into tags (2 1/2x5 approx.) punch holes to string ribbon through. Decorate with fun punches such as the notebook punch, white gel pen, ripping, etc. Here you see me painting with the white smooch inside the lines of the mummy stamp. It just makes the image pop. get out the sandwich baggies and fill with Halloween candy and decorate with ribbons. have fun! Go to mystampbox.com to see the finished result. ho ho ho! can you believe the snow? is it June again? hahaha. well as soon as riley got off the bus I let the kids go out for a minute or two. (I would've longer but I haven't even taken the tags off the winter suits yet. not ready for winter yet!!!! would you expect anything less from my kids? too funny. well the traveling to teach season is here. And I love it. I adore traveling all over teaching scrapbook classes, it has been fun. But has left me with so little time for playing on the computer, or doing my blog. So I do apologize. However, I have been home this week and have not blogged because I have decided to add more adventure to my life. yep, for my facebook friends, this is no surprise, but I signed up for 4 days a week boot camp for the next 2 months. I just found that I need to get in shape. I'm not having any more kids. we are done. So it's time to go down that adventure of finding the old me. Will I be able to do it? who knows? but I will give it a fair chance. So far I have only done 2 days of boot camp, another tonight, and I can barely move. no exaggeration, I am stiff, sore, not even funny. I hurt. I never done that many laps, push ups, squats, skipping, jumping jacks, etc since my glory days where I played competitive sports. But it can only get better right? But this weekend I plan to do nothing but clean house and visit, and scrapbook. I have a few fun things that I need to catch up on so I am going to start some projects and hopefully have some stuff to show you next week. Otherwise, check back here tomorrow for a cute Halloween tags I am doing. I will give you the link to follow to the site. They are sweet. I was asked to be the guest designer for this absolute AMAZING sketch site. I love this cute little blinkie they gave me. GREAT colours! I had so much fun playing with the sketch. I liked one layout so much that I submitted it for publication and it got picked up, so I can't show you that one. Great sketch ladies!!!! So come on bloggers play along if you like. I'd love to see what you designed. Once again, I am missing our fabulous blog hop because I will be driving to Edmonton this weekend, so I will have to check out all the designs when I return next week. Fellow MSB team, you guys are so talented, and it is neat to welcome more talented peeps! have a fun hop! 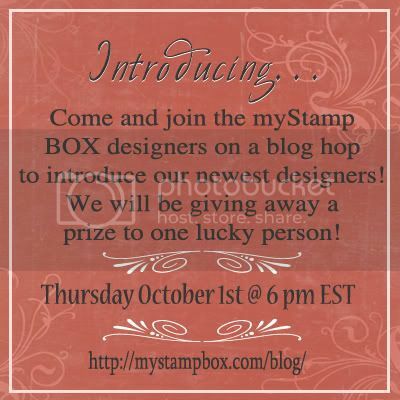 We're so happy that you joined in our blog hop introduction to our new myStamp BOX designers! If you should have happened upon my blog today, please start at the myStamp BOX blog for an amazing journey of fabulous cards and introductions to all of our new designers. I would love to introduce her by first giving her a card of Thanks! I want to say hi & thank you for bringing your talent to our team and it is going to be exciting to see what you have to show us. Thank you for being unique! Can't wait to get to know you better. I am very simplistic when it comes to making cards (which for any of you who is taking either of the card classes designed by Cathie Allen this weekend in Edmonton, will find this funny as she does about 37 steps for a card) But I had done this card for a previous assignment and had never shown it before. It is layering circles in different colour cardstock and inking a few edges. Very quick. but cute. "I'm Elisa and currently live in Washington with my hubby whom is active duty Navy and our 4 amazing kids. We also have 2 min pins Lola and Rocky that keep the adventures going and just to mix it up a bit we just adopted a rabbit. I have been scrapping for over 17 years now and love every bit of it. I love the way this industry keeps changing and all the new goodies to mix my photos with. When I create I draw my inspiration from color and the personalities that I have captured in my photos. I like to think outside the box when I am creating and just go with the flow. Sometimes my projects are simple and sometimes they are filled to the rim with all kinds of things that make me happy." You have a chance to win some wonderful mSB goodies just by commenting on each participating designer's blog and by collecting the letters on each designer's blog to spell a very special phrase. When you have collected all the letters and made all of your comments, please email your phrase answer, along with your full name and email address to Allison at sosketchy@live.com with "mSB Blog Hop" in your subject line. You can send in your answer and information to win up until Sunday October 4th at 5pm EST. want to do a little hop with me? today is the day to go blog hopping. But we don't start till noon. Love to have you join in for a chance to win.